In contrast to many exhibitions, ‘Across the Divide’ has no political or social agenda but instead posits possible associations and sensibilities between the various artists participating. Nearly all the art works use only black and white and the show is an attempt on behalf of the two curators to hold a highly subjective microscope on the artistic global village, which is the reality of our times. Though the exhibiting artists draw strong inspiration from their cultural heritage, their work is by no means solely the product of it. Their membership to a globalised world allows for a reciprocal exchange of influences and references thus blurring any allegiance to a specific cultural or geographical identity. The old specificities which governed both artistic production and artists’ provenance no longer apply. 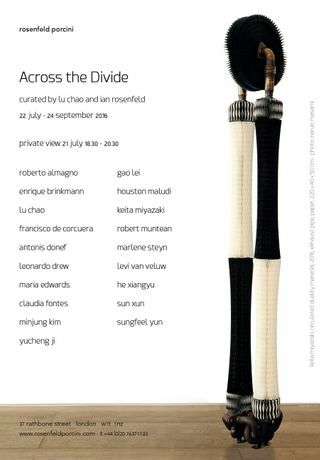 Although preconceptions abide in today’s art market, an exhibition such as ‘Across the Divide’ has the express intention of defying them by combining within the same show artists from different countries, different ages and different stages of their career.